Two theatre people in Ottawa, Jake Smith and Katya Vetrova, are developing a play that will involve some puppetry, and they've brought me in as a collaborator. I don't want to give too much away, but it's about bears. The substructure is made of cardboard and brass fasteners and controlled with three small rods. But the outline -- the part you'll actually see -- is made of one continuous piece of string. 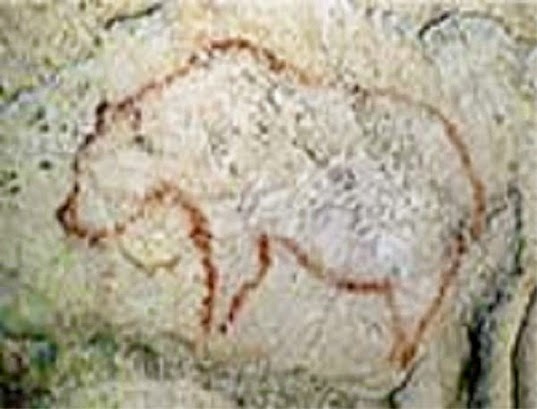 It's only glued down in a few areas, so that no matter how the bear moves, it will still have one uninterrupted outline. For the full effect, imagine that it's much larger, that the cardboard is black, that it's in front of a black background, and that the outline is made of electroluminescent wire. Who knows if this puppet will actually make it into the play... The story and format are still quite nebulous, and change a lot with each meeting!